Tea Tree Oil comes from Australia where the Aborigines have been using it for centuries. They say there are lakes in Australia, where the Aborigines go when they have been cut, bruised, hurt or sick and they soak in this lake and miraculously they are cured. It is now known that the healing properties of Tea Tree oil are vast and that lake probably has Tea Trees growing around it and in the fall when it drops its’ leaves in the water, those healing properties are transferred into that water. Do you suffer from acne? Have pimples? Maybe you have oily or combination skin? This is the face soap for you and your problem skin!! Tea tree oil is an excellent treatment for acne. A recent study found tea tree oil to be just as effective as benzoyl peroxide, without the side effects of redness and peeling. Tea tree oil can also treat minor wounds, encourage healing, and prevent infection. How does it work? The chemicals in tea tree oil kill bacteria and fungus, and reduce allergic skin reactions. It is an anti-fungal and anti-bacterial oil. 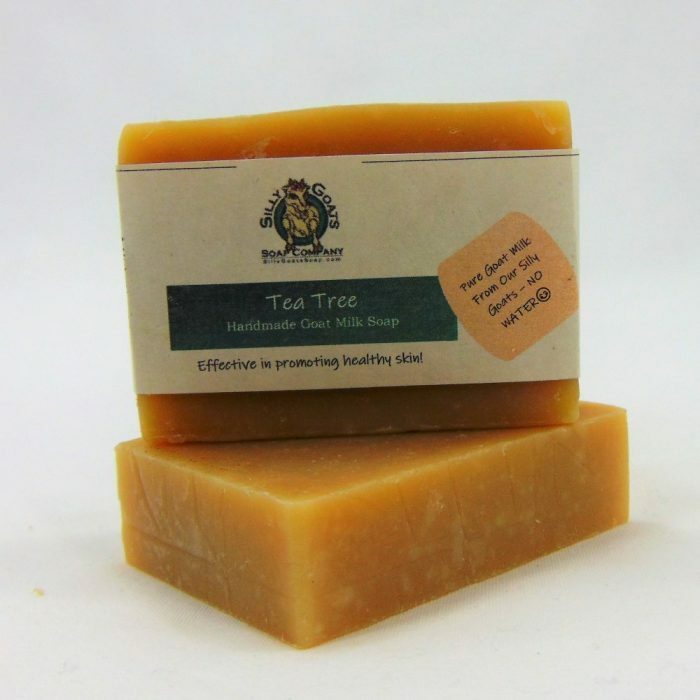 Now we know the secrets of Tea Tree and we are using it in our goats milk soap. 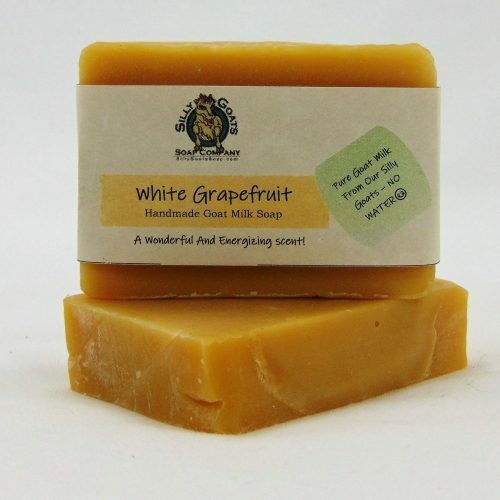 You combine that with the 50 vitamins and minerals, the alpha-hydroxy and amino acids for anti-aging that are in goats milk and you have a win-win, all natural, good for you, bar of soap! Note: In our never-ending quest to be more environmentally friendly our soap wrappers are made with paper and we also use a 100% biodegradable food-safe shrink wrap film called Biolefin. Protecting your products, preserving our planet! 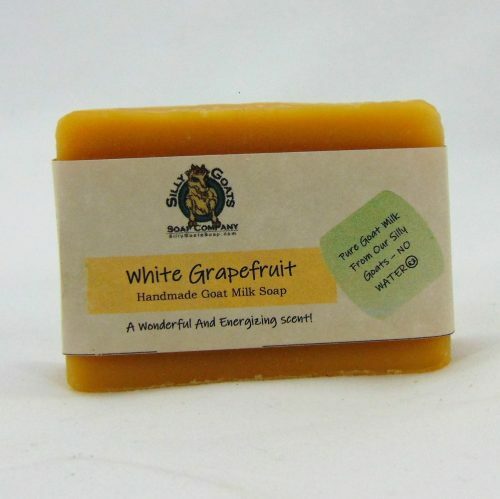 All Natural Ingredients: Fresh Goat’s Milk; Saponified Coconut, Olive, and Palm oil; Tea Tree Essential Oil. 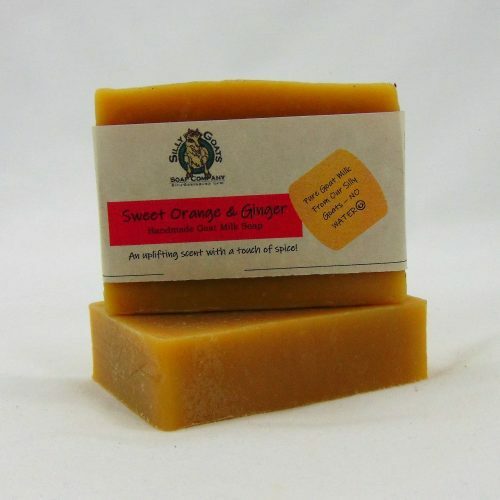 You are buying 1 hand-made bar of Tea Tree Soap, weighing approx. 4.5 ounces. I’m 66 years young and my skin is not what it used to be. The Tea Tree soap has eliminated all dry skin patches as well as being a great shampoo. GREAT PRODUCT!!!!!!! This is truly the only soap that has kept my acne under control. It smells very fresh, and my skin feels great! I just wanted to thank you. I really love your products it’s been such a wonderful change for me and I’m definitely having my whole family switch too! I had no idea where to write the feedback online, I usually dont write feedbacks at all, but I have to with sillygoats. Because I am so grateful! Thank you for the personalized thank you mail with my purchase as well! I have extremely dry sensitive red skin that is also very oily on t zones prone to breakouts. I break out with almost every new product from sensitivity, and the ones I do not break out with, dosent help my skin at all, it’s not moisturizing enough either. I heard about goats milk so I have been experimenting with different brands, and SILLY GOATS thank you! I not only immediately see the difference in my skin- it is fully moisturized and supple for my extreme dryness without being oily at all! Also my redness has been disappearing and my skin is so good now I feel I dont need makeup to cover discolorations. I tried a friends soap from sillygoats first, then lotion- all unscented for my sensitive skin and I decided to purchase the 16 oz bottle. and also the tea tree soap is so good for my dry scalp!! No more dandruff. I am just shocked at the results, so thankful it’s all natural, and sillygoats is so caring and conscientious I feel like each delivery is just especially made just for me! There are a lot of goat milk companies but I have noticed the difference in each one! And silly goats really cares for you! You can really tell with each product! And i thank you guys so much! I’m saving a lot of money, better skin, more confidence, better health, Thank you! Never been this excited to receive a package in the mail! I love tea tree oil for acne control. 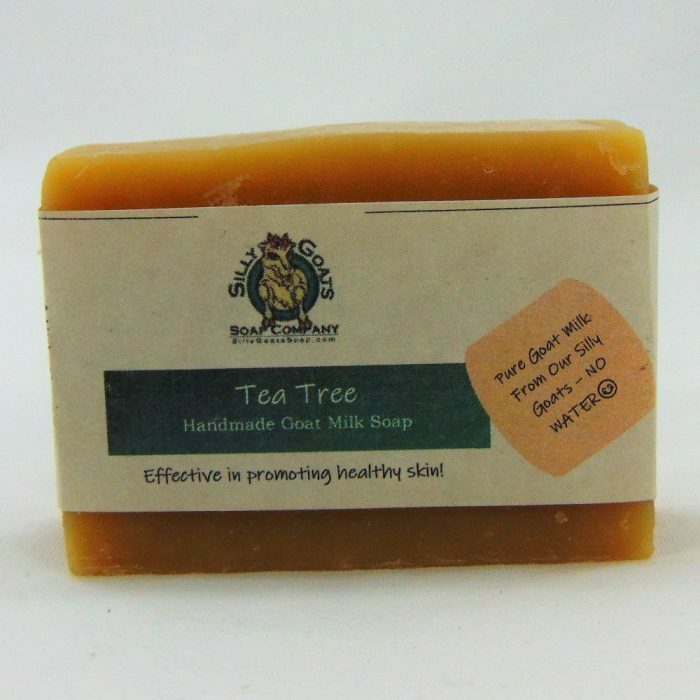 Very happy with this tea tree soap, which also has goat’s milk (I LOVE soaps with goat’s milk!). 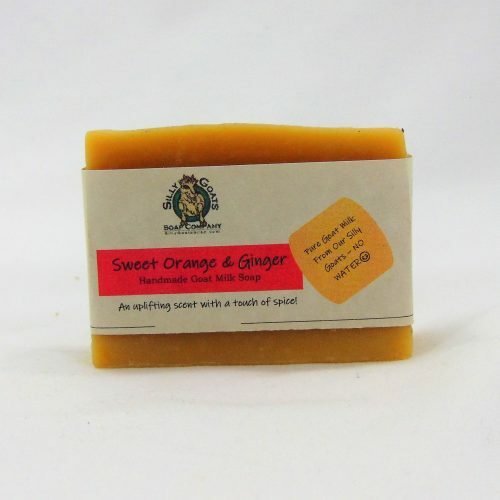 This soap has really helped to reduce my blemishes, and it is not drying! It is the perfect balance of cleaning and nourishing. My skin looks healthy. 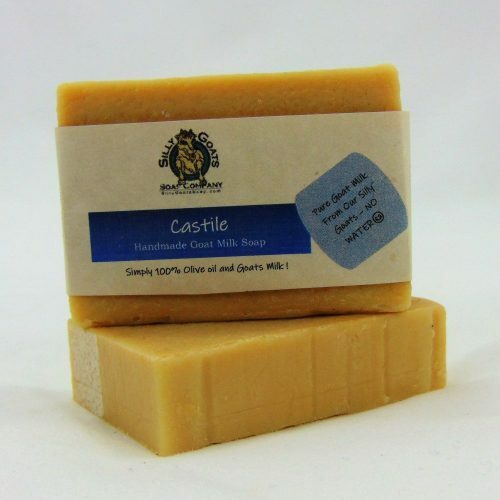 I love the natural smell of the tea tree oil, and the goat’s milk is absolutely lovely – adding a creaminess/richness to the later of the soap. I used this last night. It is not drying. The best ? It’s a gift but I know he will love it. Smells absolutely amazing!! Came packaged with care and attention to detail and it shipped so fast!! I have so many issues with dry skin, I’m looking forward to using this product. They even include a little pamphlet with information about why to use goats milk products! Very neat! I will be a return customer. Great soap. My face feels so clean after using this. I have only used it for a week and I feel my complexion is clear. Great size too, this will last for awhile! Recently discovered I was allergic to coconut oil so this didn’t work for me but the soap was lovely! The sellers are amazing! 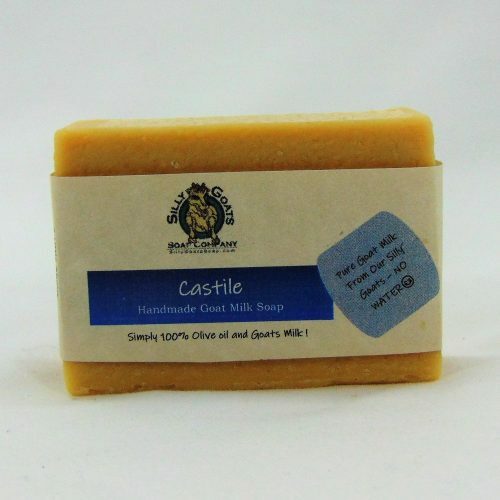 I would like to thank Chris, Sandy and all the Silly Goats on the farm for making such an incredible product (Tea Tree goat soap). I have been purchasing this on Amazon for a couple of months now but recently they had no more of this soap in stock and this made me sad. So I searched for your personal website and found you and this made me extremely happy. I received my order today right on time. This product has done wonders for my and my families skin. I was not a believer of natural products until all we did was itch and get rashes from the harsh products we got from the store. The first time we used your soap all of our skin problems have gone. My husband, son and I will be your loyal customers. We are now in search of living with more natural products because of you. Acne has been a problem in our family for generations and we have used everything. We love the Tea Tree, goats Milk soap. It is natural loaded with essential Tea Tree oils and it is doing the job for my family!